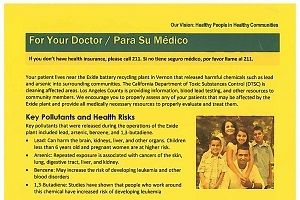 The Los Angeles County Health Agency and the Department of Public Health are continuing outreach efforts to support residents in the communities affected by the release of hazardous materials from Exide Technologies, the former battery recycling facility in the city of Vernon. With the support of Supervisor Hilda L. Solis, the Department of Public Health led an unprecedented effort on June 10, 2017, to conduct a door-to-door community outreach event to homes within 1.7 miles from the Exide facility. Outreach teams visited households in Bell, Boyle Heights, Commerce, Maywood, East Los Angeles, Huntington Park and Vernon to conduct a health survey to understand the concerns and needs of residents and provide health education materials and resources. 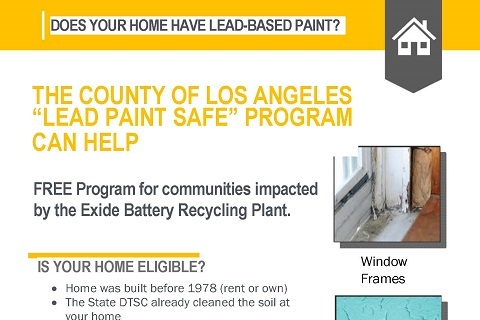 The Department of Public Health is dedicating newly available funds to provide free lead paint repair to qualifying homes in communities impacted by Exide. As DTSC completes their soil cleanup, DPH will aid residents by identifying and mitigating lead paint hazards in high risk homes, prioritizing those occupied first by children with elevated blood lead levels, followed by other young children and pregnant women. For more information, please check our Free Lead Paint Cleanup for Qualifying Homes Flyer - English and HUD Grant FAQ - English . Peeling or chipping paint in your home can be a danger to you and your family’s health. Public Health is hosting a series of community events to discuss results of the health survey and recommendations made by the communities affected by the release of hazardous materials from the Exide plant. Saturday, April 13th, 2019, 10:00 A.M.- 12:00 P.M.
Saturday, April 20th, 2019, 8:00 A.M.- 12:00 P.M. These efforts build upon previous Health Agency outreach activities to educate residents about the dangers of lead exposures and methods to minimize exposure, along with delivering resources for free blood lead screening and other healthcare services. Additionally, the County wants to ensure that residents are connected to needed resources and are supported in their advocacy efforts to live in healthy neighborhoods and homes.